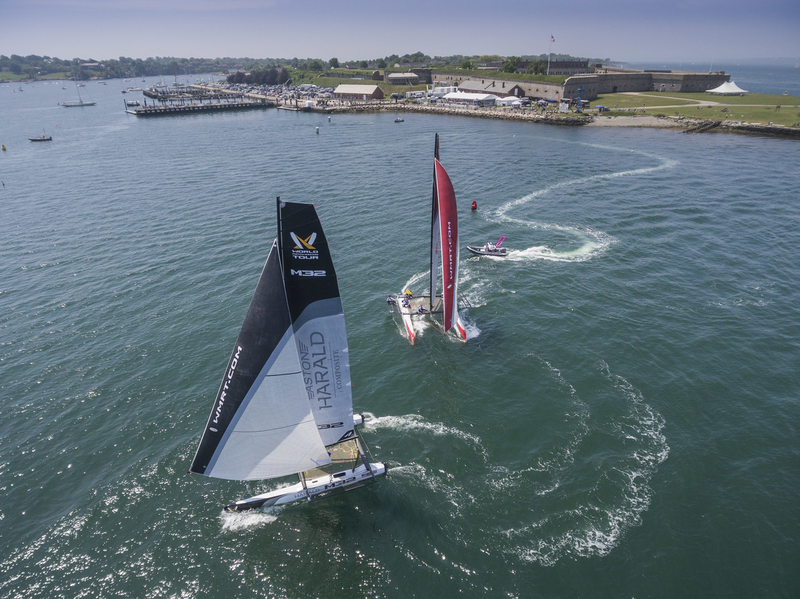 Images: WMRT.com - Press release sent by Barby MacGowan . Live replay published on Saturday catsailingnews.com/2016/06/wmrt-newport-2016-day-5-live-finals.html. 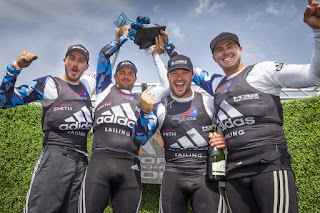 NEWPORT, R.I. (June 4, 2016) – After six days of intense racing, the U.S. Virgin Islands' Taylor Canfield and his US One team won overall victory to become the World Match Racing Tour Newport champions. Today's final race was a dramatic match between US One and WAKA Racing, skippered by New Zealand's Phil Robertson. Semi-Finals and Finals, which ended with the victorious champagne spray aboard US One, in front of the crowd lining the shore at Fort Adams State Park. Canfield's team includes New Zealand sailors Haydon Goodrick and Chris Main and Australian sailor Ricky McGarvie. The event started on Monday, May 30, with 20 teams from 10 countries. By the end of the elimination rounds, however, only four teams were left to compete in the Semi-finals. The world's top match racers aboard the nimble M32 multihulls fought tooth-and-nail around the racecourse, eliciting gasps of excitement and sometimes shock from the crowds assembled around the stadium-style race course at Fort Adams State Park. If there were any doubts about the World Match Racing Tour’s switch from monohulls to the carbon fiber M32 "speed machines," they were dispelled by this week’s incredibly competitive action that thrilled spectators. "It has been brilliant," said Håkan Svensson, owner of the World Match Racing Tour. "We have had all kinds of conditions: fog, wind, no wind. There have been lead changes, obstacles to deal with on the course, and some teams found their way around the course more skillfully than others. There has been everything for sailors and for spectators: a fantastic and enjoyable week." Sail Newport hosted the event along with sponsors Cox Business, Heineken and Channel 10. "After this week's success in Newport, the teams, the organizers and the sponsors realize Newport is a perfect venue for stadium-style racing for spectators,” said Sail Newport Executive Director Brad Read. “People of all ages can enjoy watching sailing within a few feet of the shoreline, hear play-by-play coverage as it happens, and enjoy family activities. The racing was fantastic, a remarkable showcase of sailing talent against the backdrop of Newport. It was a tremendous event." Canfield and his team finished 3-1 in the first-to-three Finals match but not without drama by the boatloads. Having now won two M32 events in succession on the World Match Racing Tour as well as dominating the M32 Scandinavian Series last season, Canfield's team surely now represents the benchmark among M32 campaigns. Canfield explained his team's success: "We have put the time in; we've been pushing hard and making sure that we are learning throughout all of this, including all the qualifying events, to make sure that we continually grow as a team, which is important to us." In today's Final, Robertson claimed the first match, but Canfield then won the next three to clinch first prize. While Canfield ultimately prevailed, there were many occasions when it could have gone the opposite way. In the last, deciding fourth race, Canfield had aggressively and repeatedly luffed Robertson out of the start. Finally, as both boats ran back downwind, attention focused on Canfield as, incredibly, for a second time in the finals, he hooked a mooring buoy. What many failed to notice was that while this was happening, Robertson had passed the wrong side of the first reaching mark of the course. The Kiwi skipper led around the course, unaware of this until he was about to head to the finish line. "We obviously missed the first mark, so technically we never sailed the first lap, so they were still waiting for us to do that...which was a little bit interesting." Robertson explained later, once he'd come to terms with what had happened: "In the heat of the moment people were making mistakes like that and the courses are a bit new and different to everyone. But that was a big, costly mistake...."
An equal eye-opener was the second race. This Canfield somehow managed to win, despite picking up two penalties and there being two collisions along the way. Earlier, both Semi-Final matches had been decided 2-1 with Canfield overcoming Ian Williams' GAC Pindar team and Robertson beating France's Yann Guichard and his Spindrift racing crew. Williams subsequently came out on top in the best-of-one race Petit Final, to secure third place overall. Håkan Svensson told the assembled crowd at the prize giving ceremony: "It is great to bring the World Match Racing Tour to Newport. It is one of my favorite places on the planet. It has been a long time since I came here for the first time in 2010 with Puma. To see everyone who is so interested in sailing to come out and ask questions is such fun. Thank you so much." The first-, second- and third-placed finishers today walked away from the World Match Racing Tour Newport with prize money of US $33,000, US $23,000 and US $18,000 respectively. All eyes are now on the final event of the season, the World Match Racing Tour Finals in Marstrand, the picturesque island on Sweden's west coast, over July 4th-9th. This event features the incentive of a winner-takes-all first prize of a cool US $1 million as well as the Match Racing World Championship title. "There will be more on for the finals in Marstrand," warns favorite Taylor Canfield. "Everyone is going to want it that much more when that much money comes into play, and that is going to change people. But if we can stay just as neutral as we can and do what we've done for the last couple of events, then we'll have a good shot at it."